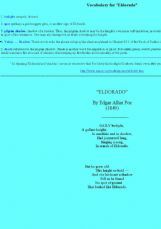 This is another poem by Edgar Allan Poe, "Eldorado." 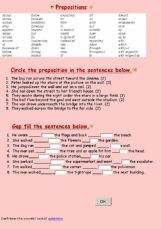 It is a short poem, and I begin this lesson with some vocabulary words and note. I then have the poem and one illustration. The choose-the-correct-answer sentences are easy, and so is the wordsearch. I end with one final illustration. I hope that this is useful. 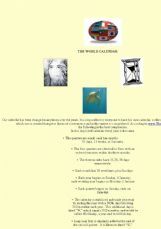 It has been proposed that we need a calendar for the entire world. I found this to be a very interesting concept, so I used the information from the site to create an exercise. There are also several pictures to show our relationship with the environment. The pictures mainly focus on females, the land, and the sea. A check on the weather. Just three excercises related to weather activities. Use wikipedia so that your students get familiar with distant places like Australia Down Under. Hello! Here is my very first online exercise. It is meant to present London to my class before starting a short unit about London. I hope you find it useful & am looking forward to your feedback! Take care! Monty. 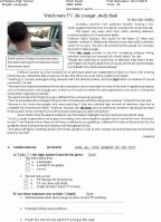 This is a reading activity which will enable the learners to improve their language skill through the exercise given at the end of the passage. 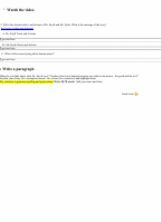 This exercise is done for the CPSJ�s students. 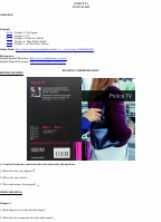 It is a reading comprehension from the book POLICE TV by Tim Vicary.